I’ve really grown fond of Telltale and their Walking Dead games. I love ruining peoples lives with my horrible decisions, its survival of the fittest after all! If you’re a fan like myself, you can rejoice, because the next instalment in the episodic game has some sort of release date. Walking Dead fans, thanks so much for your patience! 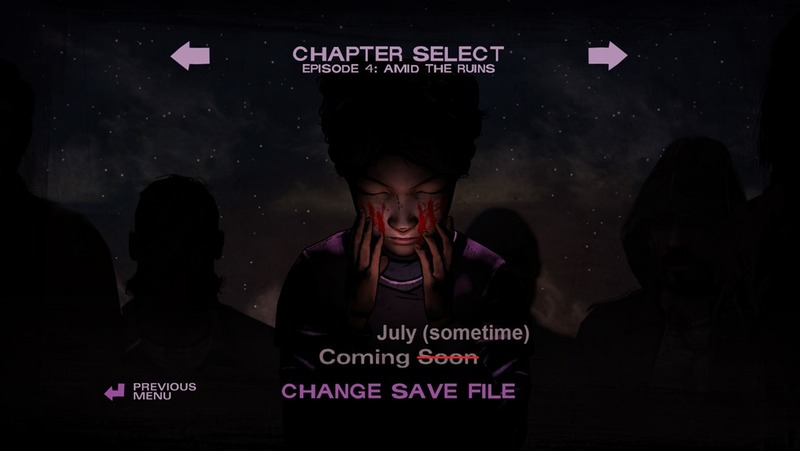 We’re expecting Ep 204 to arrive this month and should have news in the coming weeks. Fine, its not a concrete date, but rather something that will be launched later this month. I can live with that, that means sometime within the next four weeks or so. The wait between each episode always feels just a teeny bit too long. The fourth installment in this season is titled, “Amid the Ruins”. Oh boy, its going to be a big one! I only just finished the third episode, “In Harm’s Way”, last week, and I thought it was rather good. It ended in blood and gore and oh man the humanity in a typical The Walking Dead fashion, leaving me wanting more. If you have still not played Episode 3, perhaps this trailer will remind you about what you’re missing. Warning, there are definitely spoilers if you have not played the first two episodes of the second season.